Kids are naturally fascinated by animals, and I can honestly say that I've never met a kid who didn't love visiting a zoo. They are always filled with questions, and of course, the scarier the animal, the more questions they have. Asking and answering questions is an important skill no matter what grade level you teach or the subjuct you're working on. As students progress, questions deepen in complexity and purpose. Questions check comprehension and deepen understanding of material read, but questions also guide student research and exploration too. As adults, of all job related skills we need, asking and answering questions is probably at the top no matter what career path you take. 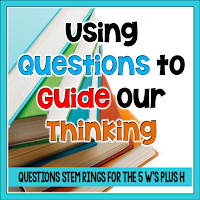 In this post, I thought I'd share questioning strategies that have worked well for my students and I as well as lesson tips using a few resources I've created. 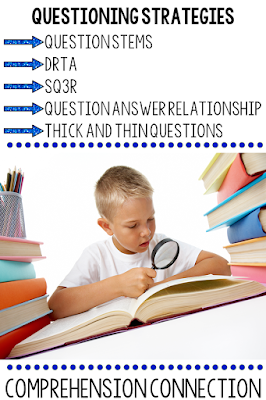 With questioning, it's important to start with analyzing questions. If we can help kids understand that not all questions are equal and that some questions are going to be more difficult to answer than others. That some questions require us to explain with more detail than a simple response, then they will be more equipped to answer them with detail. To help demonstrate this, I like sorting thick and thin questions as an introduction. 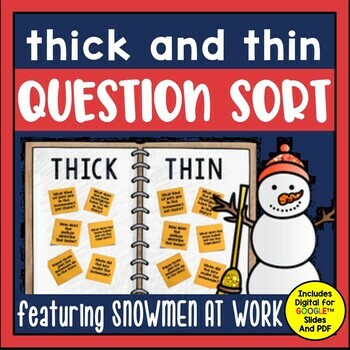 You might use a t-chart and print questions on post it notes for sorting like the resource to the right using the book, Snowmen at Work. Having your kids work in groups to discuss whether a question is thick (answer figured out in the head) or thin (answer found in the book) helps them think about why they fit each criteria. Teaching kids to ask questions and use questions to help themselves better understand what they read is not done with just one lesson or with one teaching method. 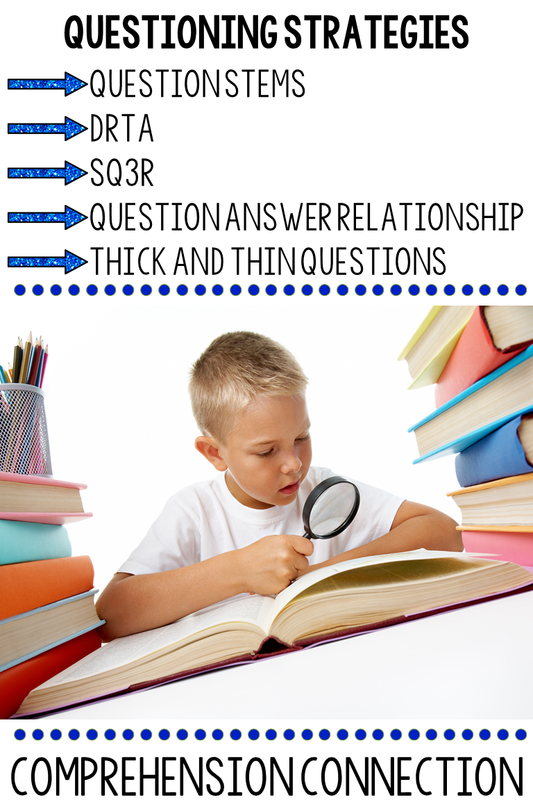 There are many ways to work on questioning with your students. Here are a few more ideas I've found helpful. 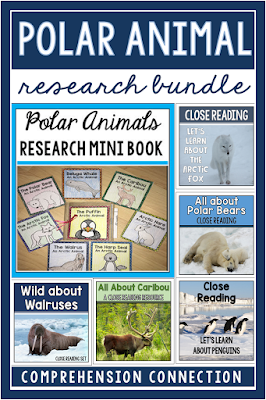 You can use these strategies for fiction and nonfiction with your students. First of all, using question stems can help your kids generate questions of their own. 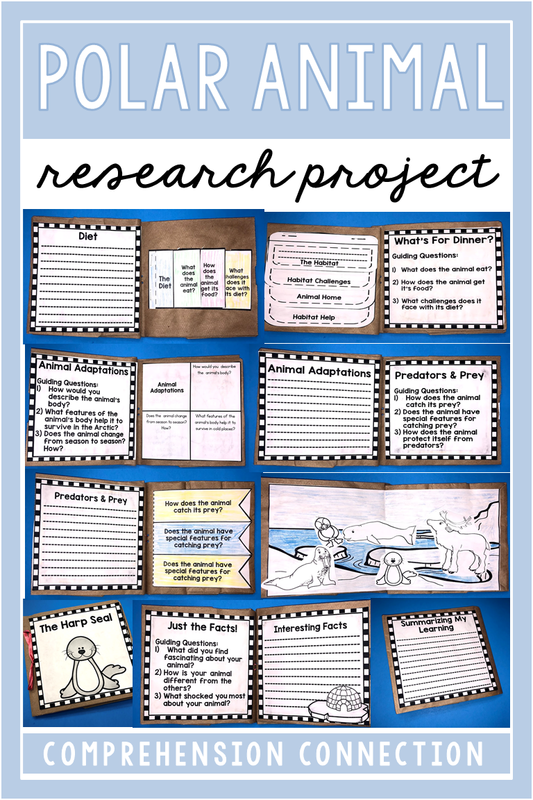 You can put them on task cards, hole punch the corner, and add them to a ring for your kids to have as they are reading like this resource I created for first and second grade. My students created and recorded their own questions before and as they read. Then, they added their answers as they discovered the information needed to respond. These can be used with any text. Directed Reading Thinking Activity is a method teachers can use to help students make and confirm predictions. Students generate questions based on the information they know and read to find the answers in sections. At the predetermined stopping points, students create new questions and repeat the process. Question Answer Relationship, developed by Tanny McGregor, is the next step to Thick and Thin questions. It further breaks down questions types into four categories versus two. These include right there, think and search (both in the book questions), author and me (inference), and on my own (answered with no text information). 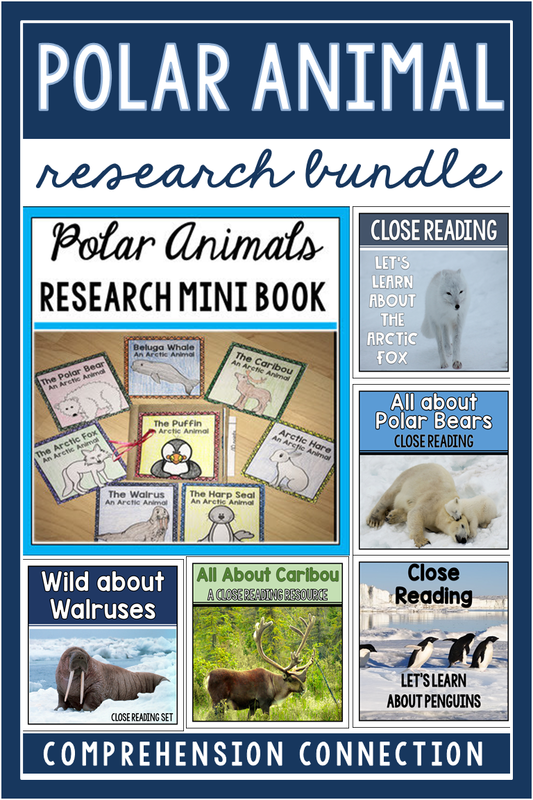 [THIS RESOURCE] from Amber Polk is one I have used often. From early on, we MUST help students practice finding text evidence to support their thinking whether a question is thick or thin. Kids must be trained to dig into the text to find support for their thinking whether an answer is "right there" or whether story clues are needed. Giving kids "flag" sticky notes and having them "mark the spot" is a great way to work on this and oral discussion with peers helps students consider multiple points of view when students disagree with the answer. In addition to using questions to check and deepen understanding of what students read, we also use questions to drive curiosity and exploration. 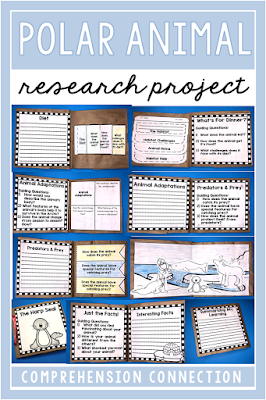 Student research should start with student curiosity. 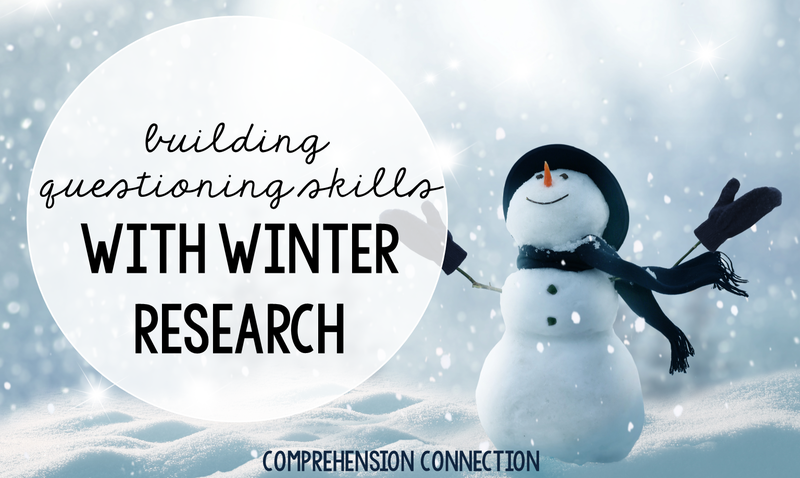 Generating questions about a chosen topic helps students narrow the searching. I will close with a free resource for you. As mentioned in my post, research should start with student curiosity and student created questions. 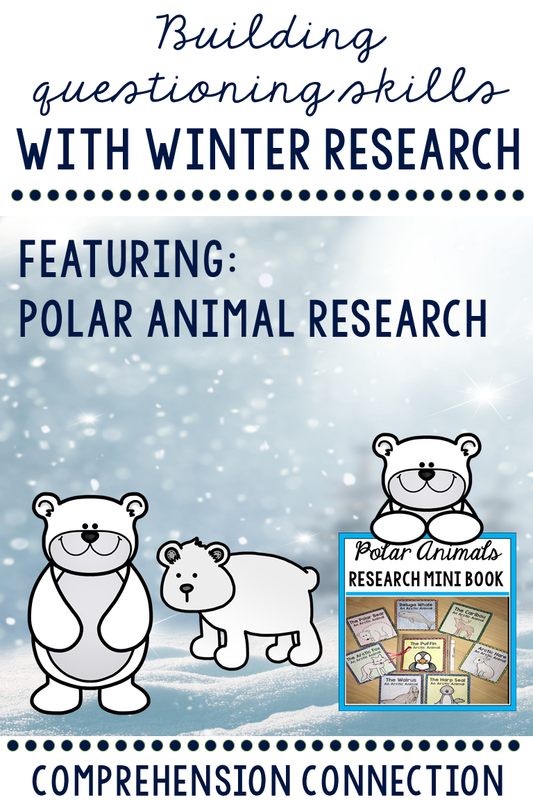 With this resource, your kids will brainstorm possible topics and guiding questions (4 topics). 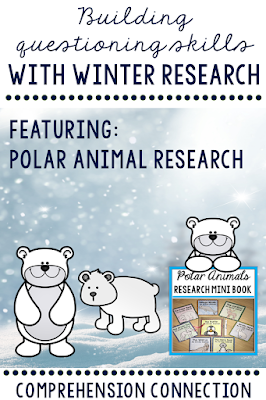 Then, they will use the related questions generated to start the research process. The resource has organizers set up for them to gather information and take notes as they work toward writing their report. Then, those notes become paragraphs (with tips embedded to guide them) and eventually, a completed report. You can use it for a variety of topics. First of all...I love anything research! Second...I have been working to build that wonder and curiosity through questions this year. It does not come easily for some. Thanks for the link up and for including me.